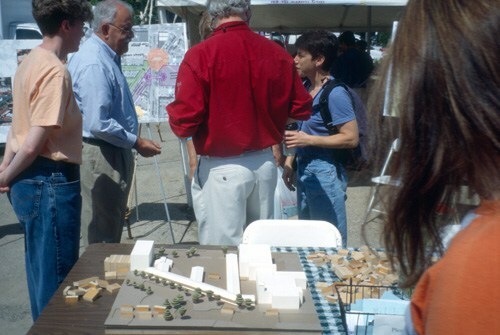 Stakeholders discuss the market layout and design during the "community charette"
The Ann Arbor Farmers Market began in 1919 in front of the old courthouse and moved to its current site (formerly a lumber yard) in 1931. Permanent sheds were designed and built by the WPA between 1938 and 1940. Today the market has nearly 100 permanent spaces under the original sheds and adjacent areas. It operates year round on Saturdays and also on Wednesdays in the growing season. Most of the vendors are farmers and some crafts and prepared foods are sold as well. The market anchors a burgeoning commercial district and PPS was asked to assist the locally based Johnson Hill Land Ethics Studio in an evaluation of the market, the market area and the surrounding district. A series of public meetings with customers, vendors and city officials culminated in an 'community charette' at the market on Saturday. Shoppers, vendors and the civically minded were all welcome to join tables of designers under a large tent erected in the middle of the market. A strong community based planning process will lead to a series of improvements in the market itself and the surrounding district over the next year.